Colgone - The start of the 2015/16 Bundesliga season is tantalisingly close, but don't expect any let-up in the preparation department between now and next weekend. Join us on Sunday for more Bundesliga goodness, as we'll be back to give you your fill of the goings on in the league of the world champions. The Royal Blues coildn't really have asked for a better day in Franco Di Santo's first game in the side. Schake romped to a 5-0 win at MSV Duisburg in the cup and Di Santo scored his first goal. Debuts don't get much better than that! Ahead of the new season, Hamburg have announced a successor to Rafael van der Vaart as club captain. The new skipper is Johan Djourou, with goalkeeper Rene Adler as vice-captain. Lewis Holtby, Ivica Olic and Jaroslav Drobny complete the team leadership. Borussia Dortmund kick-start their DFB Cup quest on Sunday away to Chemnitzer FC without defenders Neven Subotic and Eric Durm, who are carrying knocks. BVB head coach Thomas Tuchel said they should be able to resume training next week. Striker Adrian Ramos will travel with the team but is unlikely to play as he eases his way back after months out on the sidelines. Kevin Kampl is likewise a doubt after picking up a knock in training. Schalke's new striker has had an instant impact, scoring an outstanding strike for the Royal Blues in the DFB Cup. After being rested for the Audi Cup earlier in the week, Bayern winger Arjen Robben is back in the squad for their DFB Cup game against FC Nöttingen on Sunday. 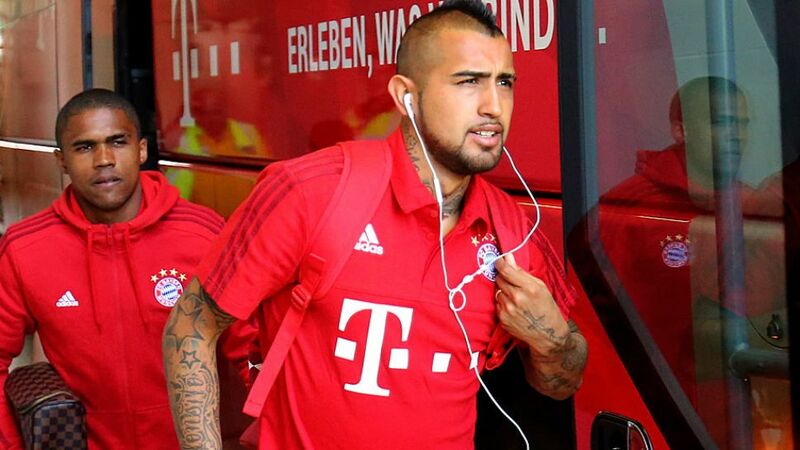 Dante, Joshua Kimimch and Thiago could also feature after training again following injury. Wolfsburg striker Max Kruse wasted little time in making his presence felt in his competitive debut for the club, finding the net early on against Stuttgarter Kickers. Bremen midfielder Felix Kroos was forced to pull out of his side's DFB Cup match against Kickers Würzburg. Hopefully he'll be back in time for the Bundesliga next week. The German record titleholders will be in cup action tomorrow, but in the meantime here's the lowdown from the FC Bayern camp. Aron Johannsson won't be featuring, but Anthony Ujah will be hoping to open his account for his new club in the DFB Cup 1st Round later today. Bundesliga's official Twitter account will be bringing you each club's best goal from last season in the build up to the start of the 53rd campaign and this one from Valentin Stocker certainly merits it's place on the countdown. "Sweating is over. Thank you very much to TSG Concordia Schönkirchen for the support," reads this tweet from VfB Stuttgart. Di Santo set to make his debut? Franco Di Santo is in great spirits ahead of potentially make his competitive debut for FC Schalke 04. There are no words to describe this clip from FC Bayern! Darmstadt's summer signing Junior Diaz took time out of the hectic pre-season Saturday schedule to give his John Hancock to a young fan. Cats have a reputation of caring very little about their human counterparts, but these three seem to have found a place in their hearts for the two Ruhr district heavyweights. The start of the 2015/16 Bundesliga campaign is now less than a week away. Unbelievable! ...the weather is sweet, FC Bayern will be moving their dancing feet. At least they will once they start training this morning.